Welcome. My name is Terilyn and my hope is to start off with a 30 day challenge to any new writers/bloggers out there. 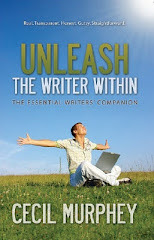 I will be challenged to write over the next 30 days what I have learned from the author Cecil Murphey and the Aphorisms/chapters from his book, Unleash The Writer Within Oaktara, 2011. I challenge you to read my daily post and simply start to write whether it be every day for the next 30 days or what ever you feel you can do. It's a great way to get our " feet wet" as writers and start writing from the heart. If you would like to read Cecil's book for yourself you can purchase it at Oaktara.com, Inscribe.org, Amazon.ca or Amazon.com. You can also check at your local book store. I hope you will follow along and take the challenge.